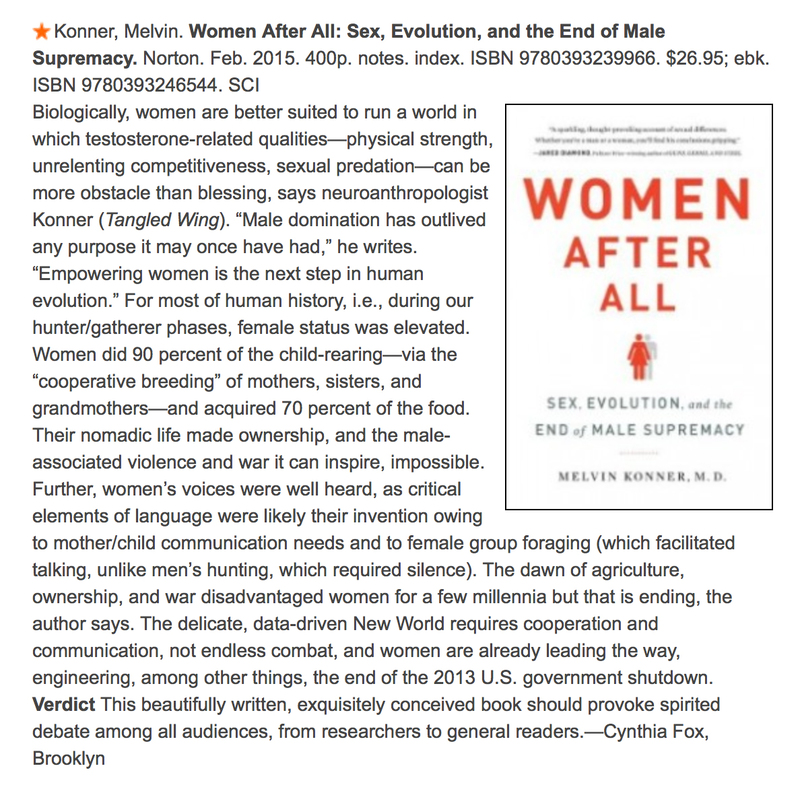 Book Reviews – Melvin Konner, M.D., Ph.D.
Cynthia Fox reviews Women After All for Library Journal, 2015. Current Anthropology Review Forum on Women After All, including reviews by Lionel Tiger, Unni Wikan, Justin Garcia, Meredith Small, Peter B. Gray, and Louise Lamphere, 2015. “Matriarchy on the March.” David Barash reviews Women After All for The Wall Street Journal, 2015. “Play’s the Thing.” Benjamin Schwartz reviews The Evolution of Childhood for The Atlantic, 2010. “Unraveling the Significance of Childhood.” Michael Lamb reviews The Evolution of Childhood for American Scientist. “The Importance of Childhood.” Morton Kringelbach reviews The Evolution of Childhood for Nature, 2010. “Surges.” Michele Pridmore-Brown reviews The Evolution of Childhood for The Times Literary Supplement, October 2010. “Science Enriches Faith… In Our Ancestors.” James F. Chisholm reviews The Evolution of Childhood for Ethos: Journal of the Society for Psychological Anthropology, 2011. David Bjorklund reviews The Evolution of Childhood for The American Journal of Human Biology, 2010. Richard Wrangham reviews The Tangled Wing (revised edition) for Evolutionary Psychology, 2004. “What Do Children Want?” Mihaly Csikszentmihalyi reviews Childhood, companion book to a PBS TV series, for The New York Times Book Review, 1991. “On the Survival of the Not-So-Fit Risk Takers.” Daniel Goleman reviews Why the Reckless Survive, and Other Secrets of Human Nature for the daily edition of The New York Times, 1990. Walter Swentko, MD reviews Becoming a Doctor for JAMA: The Journal of the American Medical Association, 1989. “The Tribe That Wears White” Gerald Weissman, MD reviews Becoming a Doctor on the front page of The New York Times Book Review, 1987. “The Rites of Medicine” William B. Hamilton, MD reviews Becoming a Doctor for The Washington Post, 1987. “A Critical Look at the Rite of Becoming a Doctor” Robert Aronowitz, MD reviews Becoming a Doctor for The Philadelphia Inquirer, 1987. “Realistic, Brutal Memories of Medical School” Anthropologist Ashley Montagu reviews Becoming a Doctor for The Chicago Sun-Times, 1987. Francis Moore, MD reviews Becoming a Doctor for The New England Journal of Medicine, 1987. Frank Davidoff, MD reviews Becoming a Doctor for The Annals of Internal Medicine, 1987. “Doctor Provides New Perspective on Medical School” William C. Conner, MD reviews Becoming a Doctor for The Atlanta Journal-Constitution, 1987. “A Bold New Theory Proposes That Humans Tamed Themselves.” Richard Wrangham’s The Goodness Paradox reviewed for The Atlantic, March 2019. “An Unevolved View of Gender Evolution.” Mari Ruti’s The Age of Scientific Sexism reviewed for The Chronicle of Higher Education Review, 2015. “The Evolutionary Roots of Altruism.” David Sloan Wilson’s Does Alruism Exist? reviewed for The American Prospect, 2014. “21st Century Vindications of Darwin.” Five books reviewed for The Los Angeles Review of Books, 2012. “It Does Take a Village.” Sarah Hrdy’s Mothers and Others reviewed for The New York Review of Books, 2011. “Epidemic of Panic.” Seth Mnookin’s The Panic Virus reviewed for Nature, 2011. “At the Cutting Edge of Human Adaptation.” Frank Marlowe’s The Hadza and Nancy Howell’s Life Histories of the Dobe !Kung reviewed for American Scientist, 2011. “Unique. Sort of.” Michael Gazzaniga’s Human reviewed for American Scientist, 2009. “Our Bodies, Our Choices. Michael Sandel’s The Case Against Perfection reviewed for The American Prospect, 2007. “The Buck Stops Here.” Daniel Dennett’s Freedom Evolves reviewed for Nature, 2003. “One Man’s Rainbow.” Richard Dawkins’ Unweaving the Rainbow reviewed for Scientific American, 1999. “A Piece of Your Mind.” Steven Pinker’s How the Mind Works reviewed for Science, 1998. “Bursting a South Sea Bubble.” Derek Freeman’s The Fateful Hoaxing of Margaret Mead reviewed for Nature, 1998. “Take Only As Directed.” Anne Fadiman’s The Spirit Catches You and You Fall Down reviewed for The New York Times Book Review, 1997. “A Dose of Dr. Darwin.” Randolph Nesse and George Williams’ Why We Get Sick reviewed for Nature, 1995. “A Muster of Veterans.” Michael Robinson and Lionel Tiger’s collection Man and Beast Revisited reviewed for Science,1991. Review of Mark Cohen’s Health and the Rise of Civilization for The New England Journal of Medicine, 1990.
Review of Renato Rosaldo’s Culture and Truth for American Anthropologist, 1990. “A Higher Love.” Ethel Person’s Dreams of Love and Fateful Encounters reviewed for MD Magazine, 1990. “Tame Thoughts on Violence.” Aggression by “John Klama” reviewed for Nature, 1988. “Jane Goodall’s Masterwork.” The Chimpanzees of Gombe reviewed for Ms., 1986. “One Gene at a Time.” Philip Kitcher’s Vaulting Ambition: Sociobiology and the Quest for Human Nature reviewed for The New York Times Book Review, 1985. “The Politics of Biology.” Richard Lewontin, Steven Rose, and Leon Kamin’s Not in Our Genes reviewed for Natural History, 1984. “The Darkness of Power.” Andrew Bard Schmookler’s The Parable of the Tribes reviewed for The New York Times Book Review, 1984.